As the oldest commercially produced beer in Italy, Menabrea enjoys a reputation as something authentic and special. 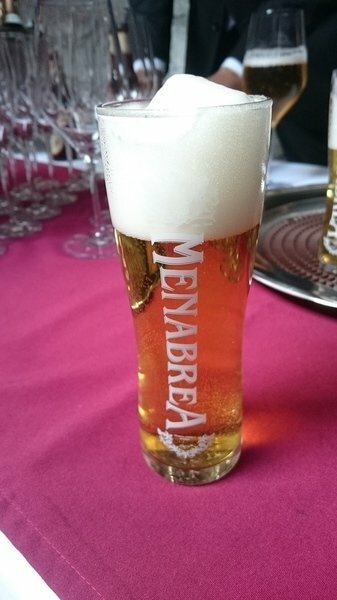 Its two varieties, ‘Bionda,’ a pale lager and ‘Ambrata,’ an amber-coloured ale, have been brewed solely at Menabrea’s brewery near Turin since 1846. A combination of maize and barley from Champagne, hops from Bavaria and water from Alpine glaciers give it a crisp and refreshing quality. As part of its welcome party to the UK, Edinburgh Foody was invited to sample Menabrea in the company of bloggers, chefs and the Italian consul general at the wonderful Divino Enoteca. 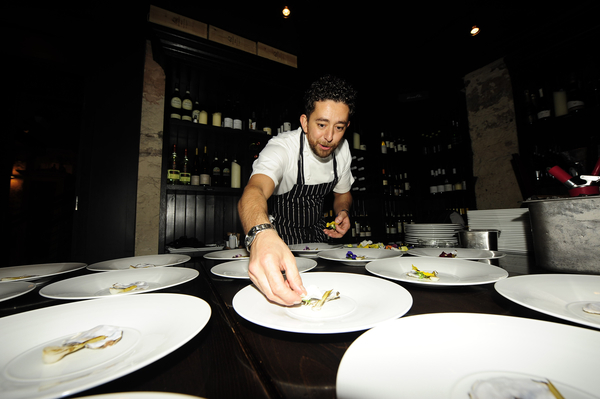 A special menu inspired by Menabrea was created by Antonio ‘Lello’ Favuzzi, the head chef at London’s L’Anima, who gave traditional Italian dishes a local twist with Scottish ingredients. All of the seven courses were delicious and together made for a very memorable dining experience. We enjoyed Menabrea with the canapés and thereafter an array of wines from Divino’s excellent selection were paired with the rest of our meal. 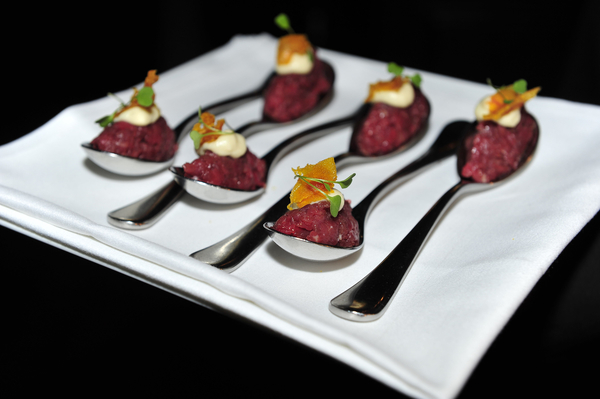 Of the canapes, the steak tartare topped with a quail’s egg and a sliver of an Italian cured fish roe, bottarga, was exceptional. The amuse bouche, Menabrea drunken oyster, was a moist and salty bite encased in the perfect crunch of its light beer batter, whilst the antipasti of white crab from Troon was delicately meaty, enriched with a zing from sweet red onion puree. As we moved on to the bigger dishes things got even better. Our ‘primi’ was a hand-rolled pearl-shaped pasta called Malloreddus, which is native to Favuzzi’s region of Italy. It was infused with saffron and paired with seafood. A colourful and satisfying dish, the pasta had a gnocchi-like density and gently ingrained lines across its surface which provided an interesting mouthfeel; a contrast to the bouncy texture and sea burst of the Shetland mussels and razor clams with which it was topped. But undoubtedly, the ‘secondi’ was the star of the night. 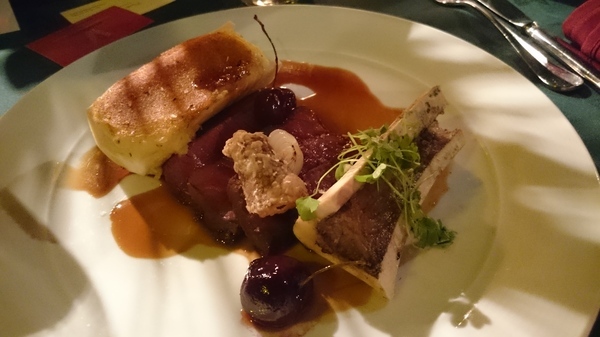 The Orkney beef fillet was hearty but not overbearing, arriving finely sliced and perfectly pink, served with dark, juicy cherries and accompanied by two halves of a bone, one stuffed with marrow and the other with a smooth potato mash and Lanark blue cheese – I could have eaten it forever. The whole dish was a wonderfully complementary combination of sweet and savoury and was seamlessly followed by our ‘dolci,’ an almond tart on a base of crumble with licorice root. I found the crumble too chewy and compact, but the sharp aftertaste of aniseed worked surprisingly well with the lingering glow of the almonds. The food was served over the course of many hours, allowing conversation to flow and speeches to be made between courses. An air of Italian conviviality was aided by Divino’s fantastic wines and Menabrea’s easy drinking. With a more pleasant and natural taste than other commercially produced beers, the Bionda particularly would go well with appetisers, conjuring an image of a relaxed Mediterranean lifestyle. The Ambrata was sweeter and better suited to desserts. And if Favuzzi can create such amazing dishes using it as his inspiration, perhaps we all need to drink more Menabrea and see what we can do! Menabrea is available in select bars and restaurants across the UK. Visit their website or follow @MenabreaUK on Twitter. 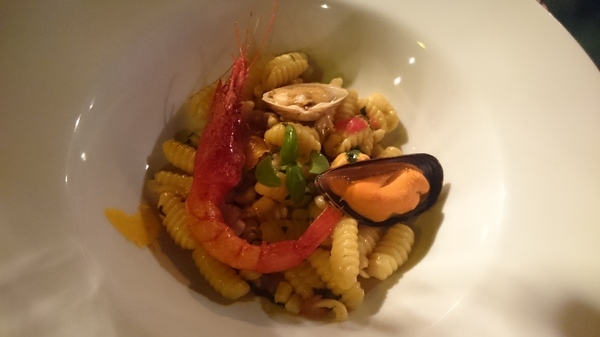 Amy dined at the invitation of Menabrea & Divino Enoteca. Last updated by AmyB at July 23, 2015 . We’ve just published an exclusive video interview with Lello, L’Anima’s Head Chef at http://www.gentlemensluncheonclub.com/events/lello-lanimas-head-chef-101050/“>London Let us know what you think!